Following the Typhoon Haiyan’s disaster in the Philippines, the Tasmanian community has rallied behind the Filipino community by donating about 300 boxes of relief goods, 3 tonnes of rice (3000 bags of 1kg bag of rice), over 2000 pcs of Mi Goreng Fried Noodles and nearly $14,000 in cash. The relief goods were mostly made up of used clothes, tents, blankets, linens and some were also brand new. I contacted the local newspaper Mercury on Sunday, 10 November 2013, after it featured a full length front page news about the Typhoon Haiyan (local code name Yolanda). By the next day, Monday (11th) , Mercury wrote an article stating of my planned to undertake a fundraising. By Tuesday (12th) , the front page of the Mercury featured 5 local members of the Filoz community. Following that day, the response from the community was overwhelming. On that Sunday (10th), I contacted the Philippine Consul Peter Cretan if we can use his office as a drop off point for relief goods. Mr Cretan agreed, so by Monday, the appeal for donations was printed by Mercury. By Tuesday, the Philippine consulate office was inundated with donations of relief goods from that day onwards until last week. I was overwhelmed with emotions when I visited the consul’s office on Wednesday (13th) to find the conference room almost full of donated goods. The immediate response was overwhelming. I was amazed how generous the community is. The cash donations also started to flow after Mercury printed the organisations’ bank account details. I realised later that I needed to organise a working bee to pack the goods that weekend; so by Thursday, through social media, I and Marie Palencia requested the community to assist in packing. By Saturday, I was overwhelmed with the response from the community, nearly 30 people turned up to help in the packing! We had to organise another packing on that Wednesday as it was apparent that the goods need to be packed, otherwise, the consulate’s office would have to move to another area!. We packed nearly 150 boxes!. 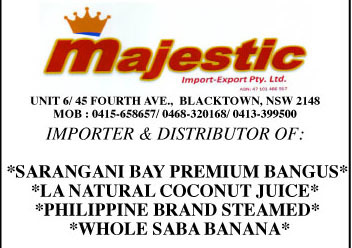 On Friday, 22nd, the first shipment left Hobart. By Friday, 29th, another load of relief goods were shipped. Overall, we had 4 days of packing due to the enormity of the donations. Marie Palencia and I coordinated most of the packing with tremendous response from the community. The volunteers for the 4 days of packing came together with such enthusiasm and eagerness to assist; I was overwhelmed with the bayanihan spirit that was shown in those days. To this day, I still receive a number of calls from the public wanting to donate. A vigil was organised, by Dona Leach at Franklin Square which was attended by nearly 200 people. Cash donations and in-kind donations were received that night. Through the support of the newspaper Mercury, we were able to reach out to the mainstream community, for without their support, it will not have been possible to receive such response. The vigil was attended by the Premier of Tasmania Lara Giddings and a number of local politicians who showed their support to the community. Mary Masina and Dona Leach, organizer, at the vigil. At the vigil, (l-R): Education Minister Nick McKim, Victor Folloso, Tasmanian Premier Lara Giddings and Florence Parker. A dinner fundraising was organised at RSL Claremont on 24 November and through this event, we raised nearly $2600. The lechon was donated by Lorie Harvey, catering was donated by the Philippine Consul and through the effort of Liezl Correa, Rose Crosby, Beverly Briers, Carmelita Poulson , some dishes were donated by PACT, the diners had a great meal that night. Marie Palencia with the assistance of Kypler prepared the video presentation that night which provided the audience with eerie images of the devastation left by Typhoon Haiyan. On 30 November a sausage sizzle at KnD Derwent Park resulted to $643 of profit towards our fundraising effort. Through the initiative of Adrian Smith, we have 5 more bookings at KnD. The initial sausages were donated by Robbo’s meat and the bread was donated by Bakeries Wholesaler. I received a donation of $50 from my colleague at work towards the purchase of sausages scheduled in the next few weekends. At that same day, the PACT also attended the Rosny McDonalds store to raise funds; they were requested to wear the national costume and performed some cultural dance; I understand that the Rosny McDonalds were donating their proceeds of the day to the fundraising effort. The Italian Pensioner Association of Hobart under the leadership of Mr Liberator Alloca has promised to donate their proceeds of their end-of-month gathering which was attended by the multicultural community. Mr Alloca also organised a dinner event specifically for the relief appeal on 14 December; he pledged that all proceeds that night will be given to the relief appeal. Entry for a 3-course meal is $30. We have another sausage sizzle on 14 December again at KnD Derwent Park which means that we will be very busy that day. Forthcoming events include a “Concert for a Cause” which will be held at the Tattersall Beer and Food Hall. Musicians are providing their services free for that night; $10 door charge will be given to the relief appeal. The musicians responded from my call for performers which was printed at the Mercury; the response was overwhelming; we can virtually hold 3 concerts with the numbers of musicians that responded! Overall, although it has been emotionally and physically overwhelming, the last 2 weeks had been very fruitful in terms of providing the relief assistance to our countrymen. There are a number of families here in Tasmania whose families were directly affected by the Typhoon. To date we have sent funds to purchase relief goods which were distributed in Daanbantayan; tents and mosquito nets were provided for the town of Concepcion, Iloilo; medicine were provided to Ormoc; funds were provided to repair a classroom in Masbate and funds were provided to feed the number of families that migrated to Manila from Tacloban. PACT under the leadership of Victor Folloso has provided cash to a number of families in Hobart. The FilCom from Launceston has also provided some funds towards our relief effort. This fund was provided for the purchase of relief goods in Ormoc. I could not thank enough all the volunteers who helped in the 4 days of packing; especially those who attended the very early start of 630 am on a Friday to load the truck; those who volunteered a day of sizzling the sausages and everyone for donating their money for the relief appeal. The Tasmanian community is very generous and I could not thank them enough for such show of generosity. Our focus now is to assist in the rehabilitation; we have initiated an “Adopt-A-town Typhoon Haiyan Disaster Rehabilitation Program” which aims to assist a number of barangays in rebuilding their community. We are hoping for corporate sponsorship and cash donations for this purpose is very much welcome. Maraming, Maraming salamat sa lahat! Maligayang Pasko at Manigong bagong taon!